Don't get me wrong, I love new furniture, but I also love having furniture that has some personal history to it. When friends move I usually find some room in my house for a piece of furniture or a knick knack that keeps the memory of them and I am always reminded that they are not that far away. 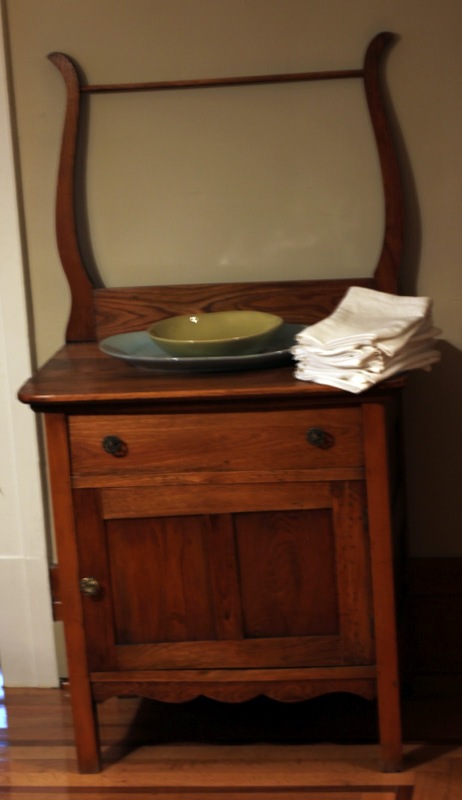 The latest piece I have acquired is this old washstand from my friend, Jennifer, who recently moved to Winnipeg. When she had it in her house, she didn't put the back towel rack on it, and I thought at first that I would prefer it without the rack too, but I put it on one day to keep it out of the way and it has grown on me. The only thing is that the bottom cabinet has a latch to keep it locked and somehow Max has figured out how to open it. You know the funny part is that I had the exact same table when I was growing up that I used as a nightstand. Only it was painted taupe. Are you still in Scotland or back in France?